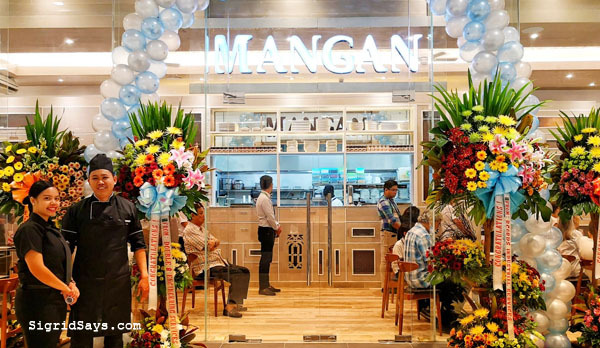 Mangan Restaurant Bacolod is now open and serving yummy Kapampangan dishes. 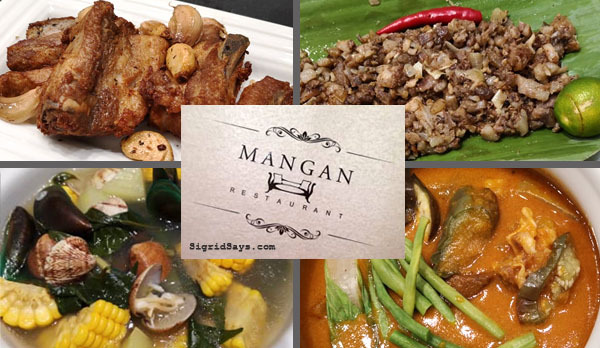 Mangan Restaurant Bacolod brings really flavorful Kampangan cuisine to the City of Smiles. 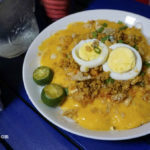 Mangan Restaurant Bacolod serves some of the most flavorful Kapampangan cuisine that Bacolodnons love. 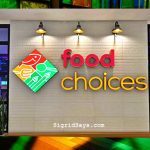 They are located on the first level of Ayala Malls Capitol Central. 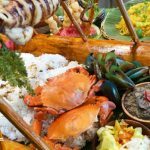 Kapampangan cuisine is already a huge part of our Ilonggo palate. 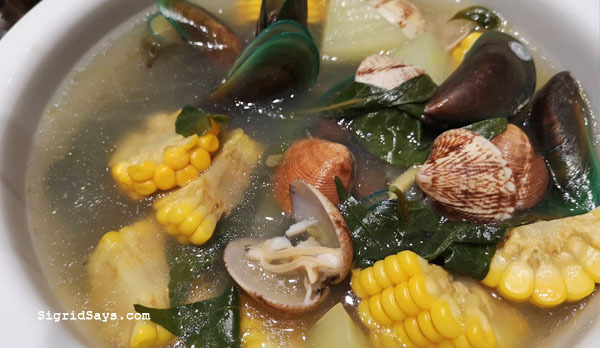 Though we don’t realize it, a lot of the native Filipino dishes we like are Kapampangan. Mangan Restaurant Bacolod on their grand opening day. 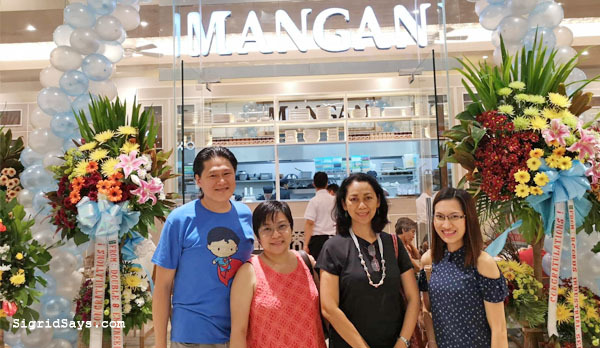 And now, Mangan Restaurant Bacolod brings us authentic, great-tasting, and affordable native dishes in their new place at Ayala Malls Capitol Central. Conveniently located on the first floor of Ayala Malls Capitol Central, Mangan Restaurant Bacolod has some of the yummiest Pinoy dishes. And these are my favorites. 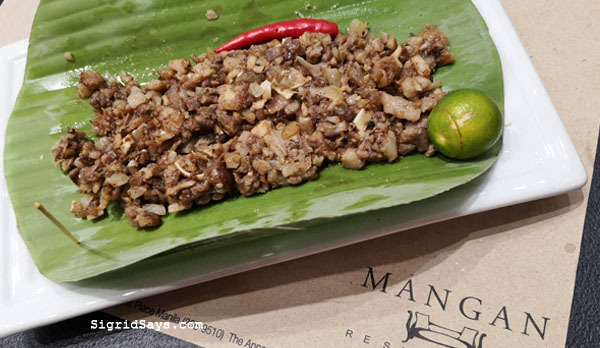 Their sisig is not served sizzling but rather wrapped in banana leaves. Love the presentation. Consume immediately or top it on your steaming hot rice. Sisig ni Mely served on a sheet of banana leaf. We thoroughly enjoyed their super rich kare-kare with lots of fresh vegetables. It’s made more wonderful with their yummy, homemade bagoong (shrimp paste). 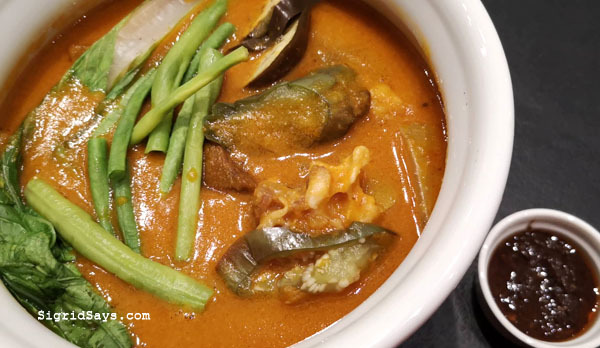 Kare-kare with bagoong (shrimp paste). So rich! 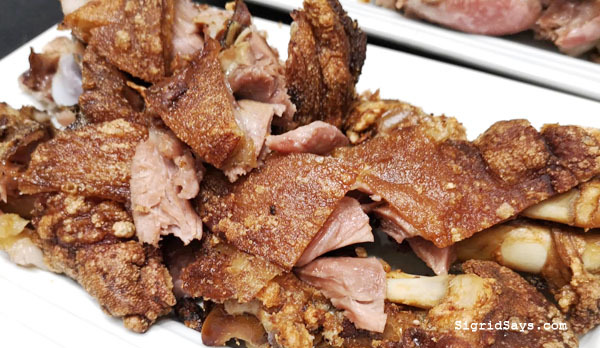 Who doesn’t like crispy pata? What I don’t like is when the crispy pata is doesn’t have crispy skin and the meat is dry. But this one is really good. 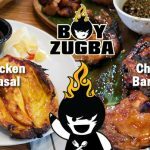 Indeed, it’s crispy on the outside and has tender and juicy meat on the inside. Dip it in soy sauce with vinegar and chili. Original crispy pata by Mangan Restaurant Bacolod. They have a spicy version. Hubby and I always love lengua because of its taste and texture. But we usually have it either as estofado or with mushroom cream sauce. This is first time that our favorite meat is cooked the caldereta way and we just loved it. These huge chunks of meat are what make up lengua caldereta. Yum! The effect is different. 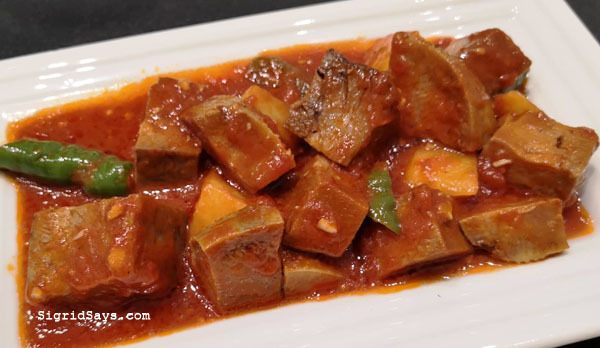 The ox tongue is cubed and cooked just right in caldereta sauce. So yummy! Try it. 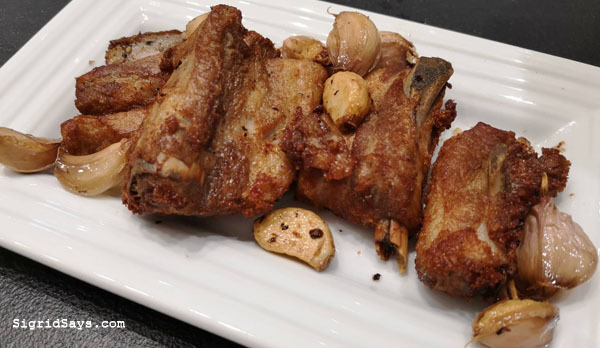 You can smell the crispy pork adobo from anywhere because it has lots of garlic. Oh my, I am drooling as I write this. Honestly, I am not very much into soups. But when I tried their shellfish soup, I did not regret it. So flavorful and not malangsa. It was totally comforting on the tummy. I have had many seashell soups but this one is so different. Love this so much. 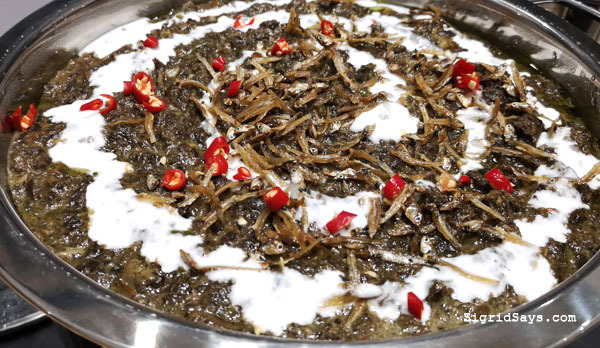 Another native vegetable dish that we like is the laing, which is gabi leaves cooked in coconut milk. The version at Mangan Restaurant Bacolod is a bit spicy and topped with caramelized dilis. Perfect combination and bad for the diet, as it is great with rice. Laing with Dulong. The caramelized dilis makes all the difference. And of course, every meal should be capped with a sweet ending. We thoroughly enjoyed their smooth and creamy leche flan with sago toppings as well as the tall glass of frozen buco pandan. 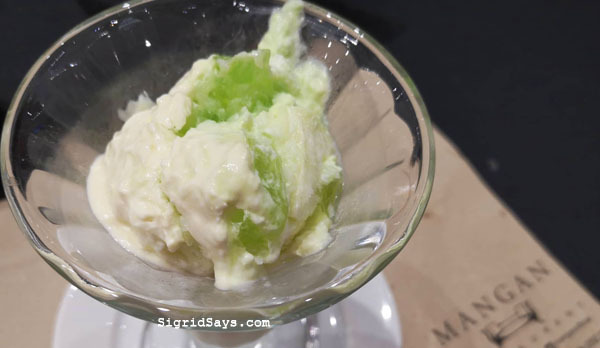 Frozen buco pandan. So refreshing. I still have to try their special bibingka, as it was not yet available during our visit. It is the kind with salted egg slices on top. Meanwhile, I will just dream until it’s available. It is a good idea to bring the family or your barkada at Mangan Restaurant Bacolod because the dishes are for sharing. Our barkada is the Bacolod bloggers. Covering the grand opening day of Mangan Restaurant Bacolod with hubby, Marz Betsy, and Marz Dhadha.